It was with interest that I read this article on the local STV website this evening, about an Artist bringing life to Edinburgh’s Decaying Cemeteries, as it announced that there would be a photographic exhibition opening soon. Sleep: Historic Cemeteries of Scotland by Bob Reinhardt runs from July 30 to September 1 at Edinburgh Central Library. Gravestones are not only a monument to lives gone, but in their state of decay a source of inspiration for artists, such as Frieda Oxenham whose explorations of graveyards have influenced her quilting. I found out about her work as she’s a contributor to blipfoto, the daily photo blog, and this has led me to spend much time looking at the inspirations she has used for her beautiful quilts. Craigwell Cottage is situated near to Calton Cemetery (just off Waterloo Place), and next to New Calton Cemetery (entrance via Regent Road), both of which can be interesting places to visit and explore the history of Edinburgh’s people, and maybe to inspire you to find out more about your Scottish ancestry – or, like Bob Reinhardt, or Frieda Oxenham, to be inspired by the shapes and patterns of the old stones. To walk from Craigwell Cottage to Edinburgh City Library for the Exhibition, access the Royal Mile at the Canongate via Campbell’s Close; turn right (uphill) and stay on the Royal Mile until you reach the junction with Lawnmarket/George IV Bridge. Turn left along George IV Bridge, and the Central Library is on the right after you cross Victoria Street. Sometimes there are ideas which inspire you, but you don’t quite get round to it… you know the ones, often crystallised in a list of New Year Resolutions, which are forgotten by February. 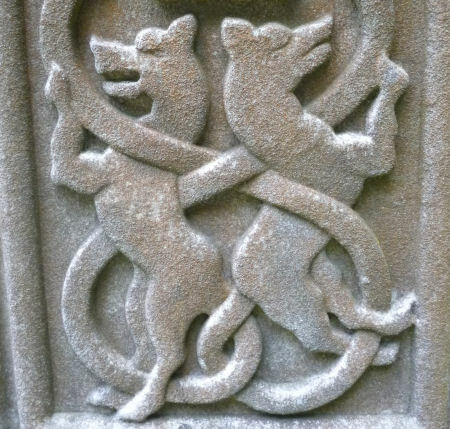 One such idea, in the back of my mind for some time, since I found out about Cameron Black‘s Book “The St Andrews Way – Restoration of a Medieval Pilgrimage”, has been to undertake a long-distance walk. But not one of the sort which requires all sorts of preparation and planning, one which can be achieved in sections, perhaps as a series of day trips. Earlier this week I was browsing the Internet looking for inspiration to inform an article which I was encouraging a colleague at the Lammermuir Festival to write about a pilgrimage from North Berwick to Cellardyke by boat. 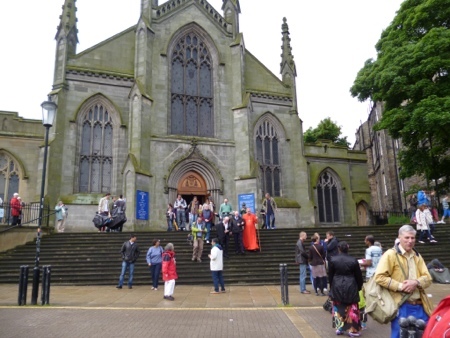 I came across an article about a pilgrimage which was due to take place on 1 July 2012, walking from St Mary’s Roman Catholic Cathedral in Edinburgh, to St Andrews Cathedral in Fife. I slotted the article away in my memory, thinking that I probably wouldn’t have the opportunity to join in. However, with the family all declaring that they were off to busy themselves in different ways, I woke thinking that maybe I just might be able to go along and achieve part of my ambition to walk a little of the way at least. We were accompanied along the way by Huw Williams, a reporter from BBC Radio Scotland, and you can hear about the walk in this BBC News item as he interviews some of the walkers on the way. 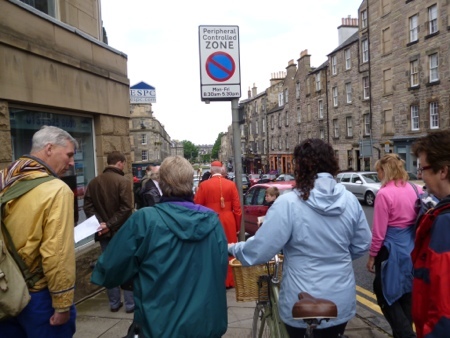 I joined the walk because of my fascination for the route between Edinburgh and St Andrews. 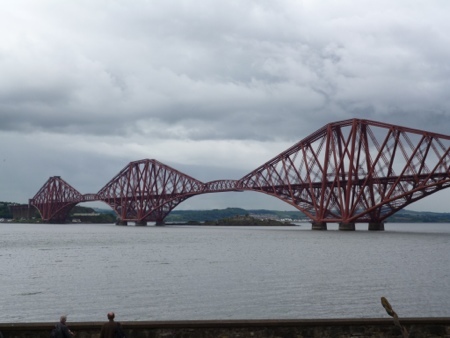 Luckily, my local knowledge and the gentle herding by the leaders of the group meant that I made it to South Queensferry by the most direct route. Huw and some of the others in the group had to rely on Smartphone apps to get them to the end point. 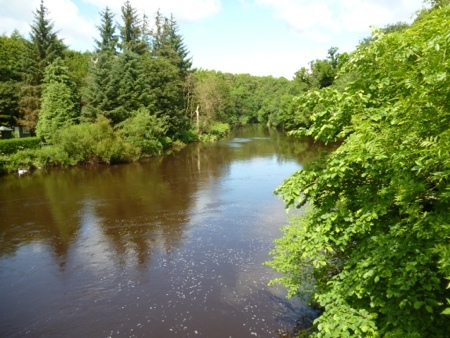 I hope that the ladies in the group of 6 who were aiming to complete the whole walk this week, including Bridget and Yvonne and the others, enjoy the experience and make it through to St Andrews. For me, that will have to await another time. Post script: I’ve followed up my researches with some investigations about the Camino de Santiago, whose revival sparked the interest in reviving the Way of St Andrews. The aforementioned journalist, Huw Williams, led me to the blog of Bob Walker, who is walking the Camino de Santiago in July 2012, and writing a blog about his walk. Some friends in Edinburgh lent me a video, The Way, which my husband and I watched and really enjoyed. They also told me about their friend Gordon Davidson’s blog about his personal journey, which I’m now adding to this postscript as it is a very moving account of his journey. 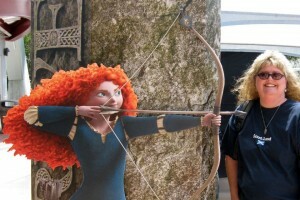 We’ve been anticipating the arrival of Brave, the new Disney Pixar animated film, since earlier this year. 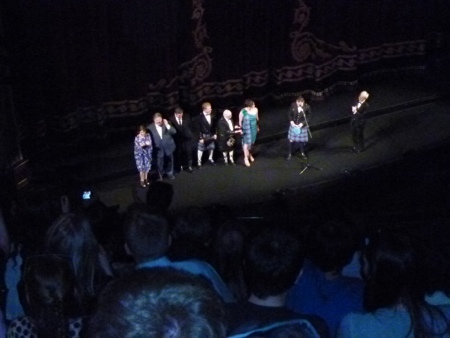 Tomorrow evening, it’s the European Premiere as the closing event of the Edinburgh International Film Festival. Since we heard that Visit Scotland was encouraging Scottish Tourism businesses to find ways to create a tie-in with the film, we’ve been wondering how best to achieve this from our base as a holiday cottage in the middle of Edinburgh. Aside from donning a Merida wig and offering our visitors a warm welcome when they arrive, what should we do? 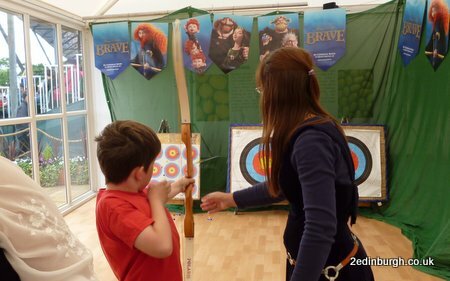 Last week at the Royal Highland Show we noticed that Bartlett’s foods were offering an opportunity to visitors to their stand to try their hand at some target practice with toy crossbows and longbows, and our son was eager to have a try. We’re heading to the premiere tomorrow night to find out what its all about – maybe this will spark some ideas for a tie-in. In the meantime, the film goes on general release here on 3 August 2012 (revised date). As Craigwell Cottage is just a short walk from the Edinburgh OMNI Centre our guests will be able to stroll over there to see it. 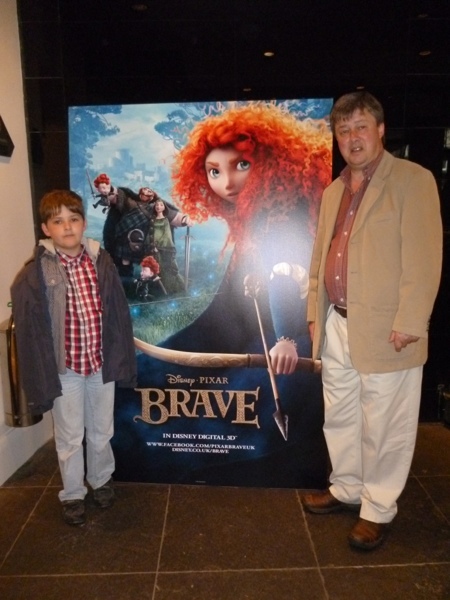 PS – we really enjoyed the film! 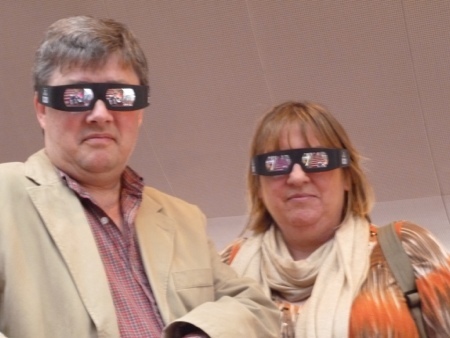 Guessing we didn't look so cool in those 3D Glasses! If time is tight on your visit to Scotland and you don’t have time to visit one of the many distilleries around the country which offer tours, then a visit to the Scotch Whisky Experience might prove an excellent alternative. We have had guests at Craigwell Cottage who have come to Edinburgh to enjoy one of the Scotch Whisky Certificate Courses which are run monthly throughout the year, but you may choose to pay a visit for one of the three different tours which run frequently each day. As a result of hearing about our guests’ experiences, and a chance meeting with Lara Dunston, a world travel blogger, I decided to pay a visit to the Scotch Whisky Experience after the attraction had kindly hosted a Travel Tweetup in September 2011 and given me a couple of complimentary tickets to go on a tour. At this point I have a confession to make. Despite being Scottish, I don’t think I have ever sampled neat whisky more than a few times in my life, and can confirm that these times have been restricted to tastes of my Orcadian Uncle’s favourite tipple, Highland Park, or as a liqueur in the form of Drambuie, which I do like over ice. And what’s more, I’ve committed whisky sacrilege by using up our supplies of whisky miniatures making our annual batch of mulled wine. I feel better for these confessions – you know that any comments on the tour and the tastings are not being done from any past history of enjoying or knowing anything about whisky. As I was going on the tour to represent the point of view of ‘ignorance of the product’, I thought it would be a good idea to bring along someone whom I know enjoys the odd dram or two. I can tell he does because I’ve seen photographs on his daily photo blog on Blipfoto, where the subject often turns to which whisky he’s been sampling (whether a wee dram from a miniature; quaffing different samples in the pub or even taking his samples abroad and in my favourite blip of all time: a cold night on the Royal Mile). 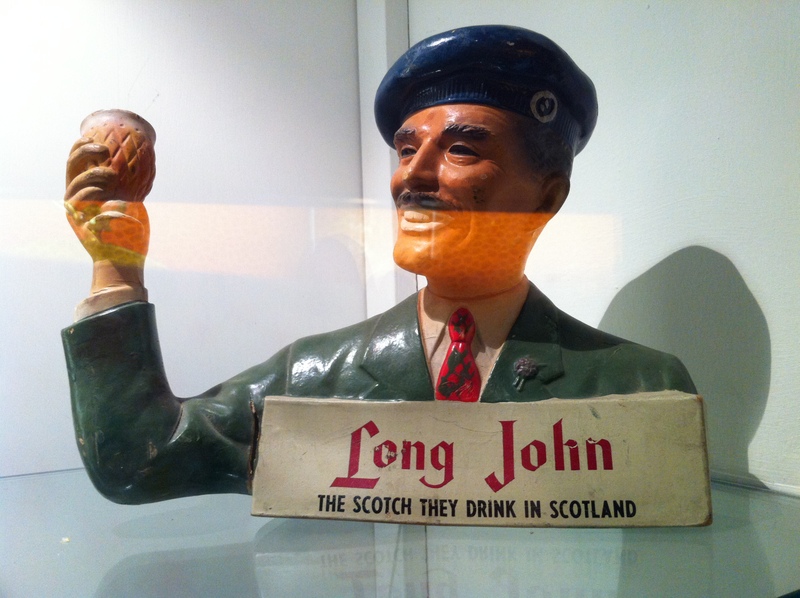 So in early November 2011, Mr G and I set off to sample the delights of the Scotch Whisky Experience tour. I knew that I’d selected the right man for the job when he sent me a message the night before saying that he was practising! We arrived at the Scotch Whisky Experience a few minutes early and took the opportunity to have a little browse in the well stocked shop by the entrance. There were plenty of gifts and cards of good quality to buy as well as whisky and whisky-related goods. 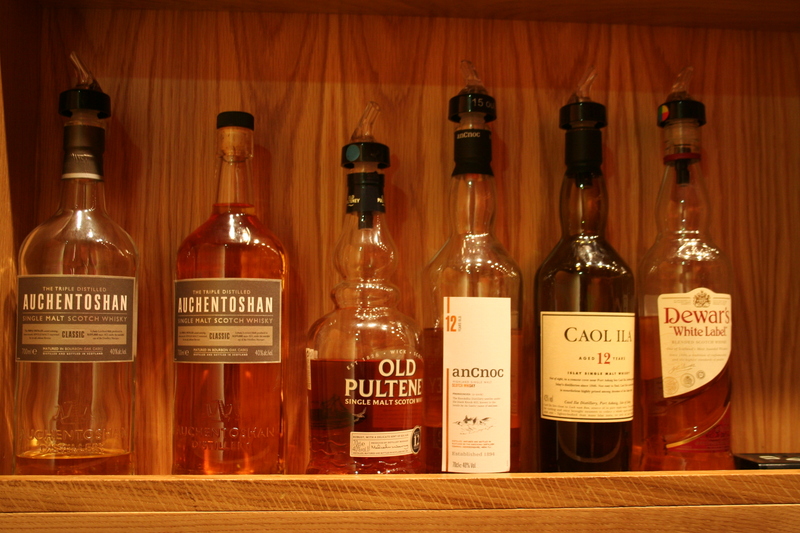 My companion became quite animated at the sight of a range of whiskies which were from the ‘Flora and Fauna’ range. He explained these were small batches of single malts released by producers who normally do not retail single malts, but usually provide the component malts for the production of blended whiskies. Blends comprise over 90% of the global sales of whisky. We were soon off on our tour, starting with a barrel ride where we learned about the ingredients which go into a single malt – barley, water and yeast. We did observe that there was perhaps a missed opportunity in this area to present photographs of the beauty of the Scottish countryside where the barley is grown. Our next stop was to learn about the different regions of production throughout Scotland, and the characteristic flavours and scents pertinent to each region. In doing this we were able to identify which notes were most appealing to us and had the opportunity to select a sample to taste. Mr G was soon armed with a peaty Islay malt, and I selected a floral Speyside. We moved to the room housing the Claive Vidiz collection – the world’s largest collection of Scotch whisky, where my companion was like a wee boy in a sweetie shop as he took some of the details of this vast collection. In fact we could quite easily have spent a lot longer in this area poring over the labels, bottles and different varieties. We were instructed in how to taste and savour the whisky we’d selected, and I can report that the AnCnoc which I’d selected was wonderful – I’m completely won over with the idea that there is definitely a whisky to suit every palette. However, Mr G’s selection smelled altogether less appealing, although very distinctive. Even from yards away his selection was reeking like a fireman’s jacket, and I had real difficulty in understanding how he could actually swallow the stuff. But that’s the lesson learned, and a great opportunity to find out more about our national drink. I’d definitely recommend a visit to the Scotch Whisky Experience to visitors who want to understand more about whisky before making a purchase to take home, or who would be interested in whiling away a couple of hours sipping some additional samples by extending their tour – either formally, or informally in the well stocked bar of the Amber Restaurant where I could quite easily have spent the rest of the afternoon. If you’re an iPhone user, then there are some Edinburgh Apps which you might like to download ready for your visit. If you’re staying at Craigwell Cottage, you’ll have access to free wi-fi and many of our guests find it helpful for keeping up to date with their emails or booking tickets for events while they’re here. Edinburgh Spotlight’s iEdinburgh app gives you an insider’s view on places to eat, current events and perennial favourites around Scotland’s capital city – you’ll even find a review of Craigwell Cottage in there. The new app for Edinburgh Bus and Tram provides up to the minute information about bus timetables. If you are looking travel outwith Edinburgh by bus or train then Traveline Scotland is a useful App to download. Getting last minute tickets at last year’s Edinburgh Festival and Fringe was made more exciting by the Theatre Ninjas app – great if you’re in town and want to take in a show. 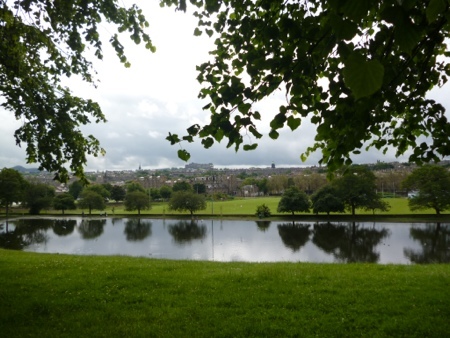 And if you’re an Ian Rankin fan and would like to take narrated walks round the Edinburgh featured in his novels, then the Ian Rankin’s Edinburgh app is the one for you. The Walking Through Time app developed as a joint project between Edinburgh College of Art, University of Edinburgh, and the National Library of Scotland overlays historic maps on present day ones so that you can see historic changes as you walk round the centre of Edinburgh. 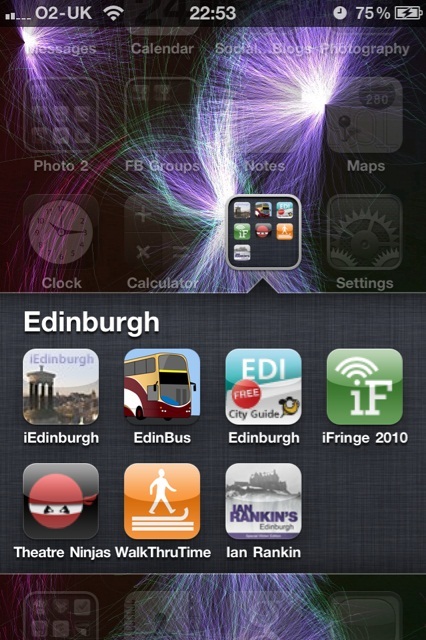 Do you have a favourite app for your mobile phone which you’ve used when visiting Edinburgh? Leave me a comment and I’ll check it out. With excellent public transport routes from Edinburgh to Fife, Craigwell Cottage might just be a possible base for walkers who come to Edinburgh to start the walk and intend to walk it in sections. And even a stay at Sandcastle Cottage, our lovely seaside home in Fife, might be an alternative base for those wishing to walk sections of the Fife part of the walk. I’ve entered the competition to win a guide, but it will be going on my Christmas wish list too! Would be great training for next year’s Edinburgh Moonwalk which I’ll be walking towards during 2011. Our 2edinburgh blog is designed to give a flavour for things to do and places to go when visiting Craigwell Cottage, our little city centre cottage (with parking) right in the heart of the city of Edinburgh. We occasionally review special events and happenings in Edinburgh, but as a family we’re not able to cover a vast range of different types of event, preferring to focus on little news items about permanent attractions or events which are annual occurrences in the Edinburgh calendar. 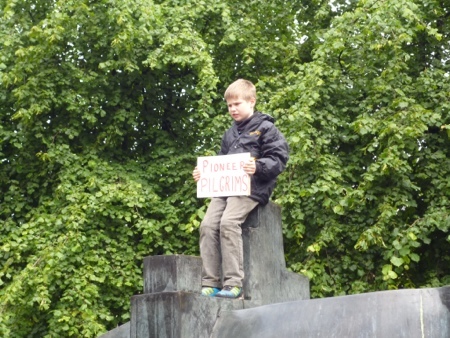 This year, our family was given the opportunity to undertake a very special assignment – that of guest reviewers at some Festival Fringe performances on behalf of the review site Edinburgh Spotlight. We were very excited to be asked, and as soon as the Fringe Programme was issued we pored over it working out and planning which shows we would ask to review, and fitting reviews in as best we could with other holiday activities we had planned. As first time reviewers we really had no idea what we were letting ourselves in for, but the owners of Edinburgh Spotlight were very helpful and patient with us, explaining what would be required. We also opted to go to some shows simply as ‘the audience’ so that we could relax and enjoy them without having to exercise our critical faculties. Our first reviews of CBBC’s Dan and Jeff in Potted Panto, and the West End Glee Club have now been published, and you can find our other reviews by following the links below We hope you enjoy sharing our experiences. Things that go…bump, rattle, klunk, cackle, woo! Thanks Edinburgh Spotlight for this opportunity to experience so much of the Edinburgh Festival Fringe 2010.
whilst browsing books about Edinburgh in my local library. 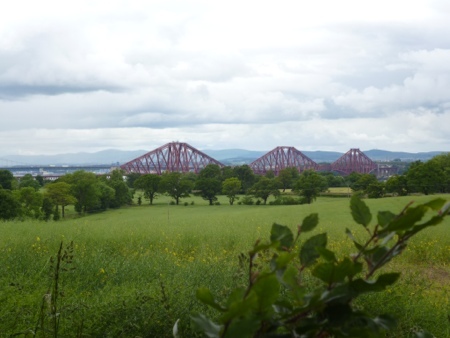 It’s easy to put in your pocket, and covers many favourite walks in and around Edinburgh. A good addition to your preparations if you’re thinking about visiting Edinburgh. 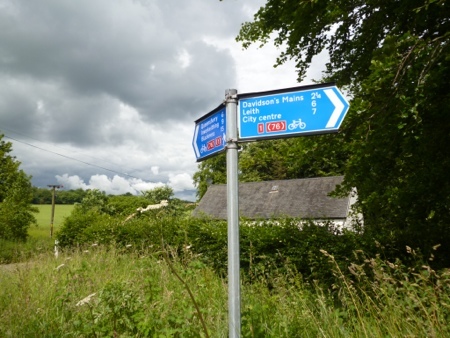 Many of the walks can be easily started from Craigwell Cottage, and there are directions for public transport to the start of each walk.